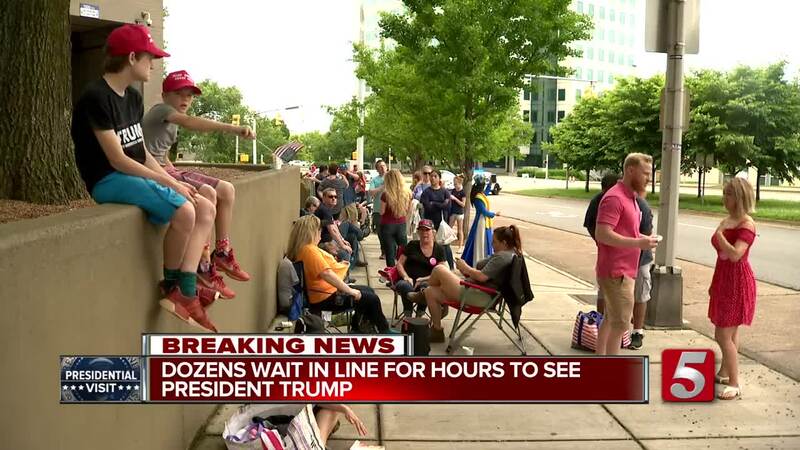 President Trump held his second public rally and third visit, drawing thousands to downtown Nashville. He arrived a few minutes ahead of schedule around 4:25 p.m. at Nashville International Airport. He was greeted by Senator Lamar Alexander, Senator Bob Corker, Representative and Gubernatorial Candidate Diane Black and U.S. Senate candidate Marsha Blackburn along with law enforcement. From there he traveled to a fundraiser for Blackburn at Gaylord Opryland Resort and Convention Center. Thousands of Trump supporters crowded the streets outside municipal auditorium. 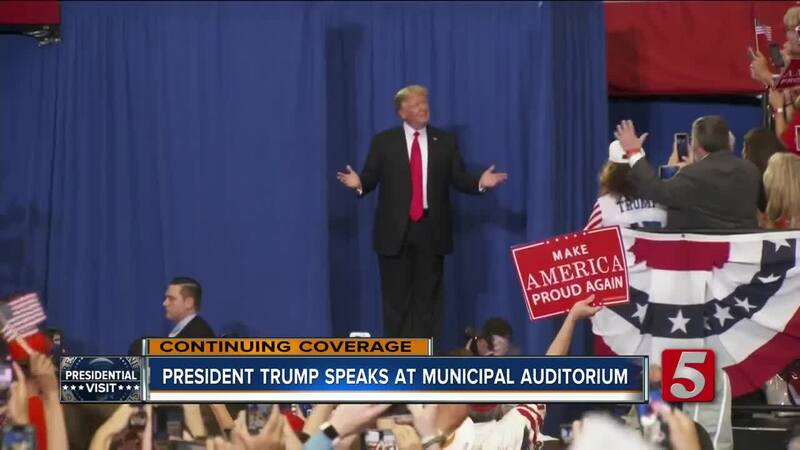 While the crowds were smaller than his first rally, their passion was still evident. "I'm so passionate about what he's doing for America. He's there for us so I want to be there for him," said Karen Patterson. However, the political divide was obvious on James Robertson Parkway as barriers separated protesters from Trump supporters. For what they lacked in numbers, the few dozen protestors made up for in volume. "I'm really surprised there's not as many people speaking up for this side of things," said one protester. Maddie Saiz said she does not see eye-to-eye with the President's supporters, but she did share a moment of civility with one outside the rally. 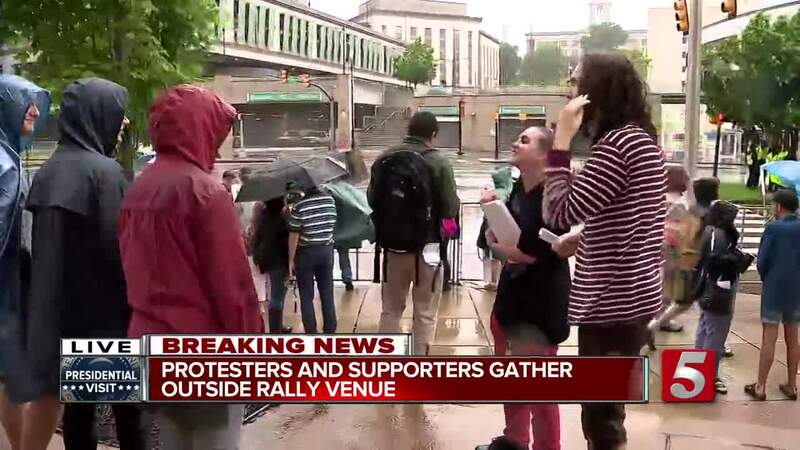 "When I was walking up here a man was sharing his umbrella with me...and he was someone who had a ticket to the rally," said Saiz. The Make America Great Again rally began at 5:30 p.m. Lawmakers like State Sen. Mark Green of Clarksville, Rep. Scott Desjarlais and Laura Trump briefly spoke to the crowd. "Trump loves Tennessee and Tennessee loves Trump," said Desjarlais. Green made sure to touch on a hot button issue, "Guns don't kill people, criminals kill people." Adkins performed multiple songs for the crowd. He said President Trump even made a request: "Ladies Love Country Boys," saying it was Ivanka's favorite song. He took the stage shortly after 7 p.m. and introduced Blackburn. She spoke to the crowd briefly, promising to support and stand with President Trump. The President went on to slam her opponent former Nashville Mayor and Tennessee Governor Phil Bredesen, calling him "Philbert" and saying he is a "an absolute and total tool of Chuck Schumer...and the MS13 lover Nancy Pelosi." Throughout the speech he touched on several hot button issues in which he always stressed the importance to vote republican. Topics ranged from his promised border wall, which he maintained that would be paid for by Mexico, to an increase in jobs throughout the U.S.